What time do the food stalls open and close? Foodhalls are open from 10am to 6pm on Saturday and 10am to 5pm on Sunday. 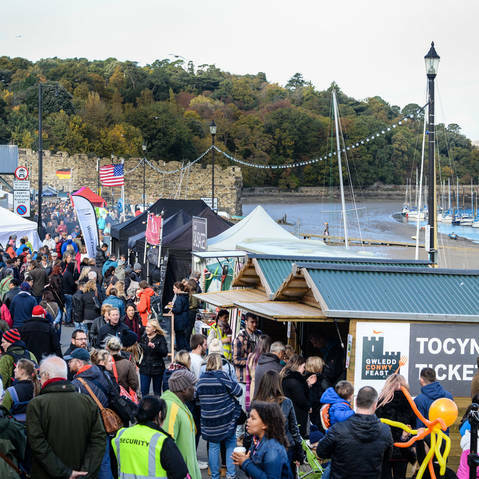 Streetfood sellers on the Quay are open until approximately 9pm and also on Friday evening. When does the Feast start on Friday? On the quayside street food and bars open at 7pm and the music starts at 7.30pm in the music marquee. There are three cashpoints in Conwy: outside and inside Spar on High Street and another in a converted telephone box at the top of High Street. However, during busy times, such as the Feast, both can run out of cash. Tesco, a mile away over the bridge, also has plenty of cash machines. No dogs are allowed in any Feast areas, unless they are assistance dogs, for hygiene reasons. Conwy town itself is very busy during the festival weekend and our advice is not to bring your dog at all. Where is the buggy park and baby change? The buggy park and baby change, run by National Childbirth Trust, is next to the River Foodhall on the quayside, just past the Mussel Centre. For the comfort and safety of your child at this very busy event, we ask that you do not take buggies into the food halls and other busy areas. We do not allow buggies to be used as shopping trolleys. Can I leave my shopping anywhere while I shop? You can leave shopping in the Bag Drop, next to the River Foodhall, opposite the Mussel Centre on the quayside. Where is the First Aid post? St John’s Ambulance will be adjacent to the entrance to Vicarage Gardens.